What’s the worst that could happen if you over-inflate or under-inflate your tires? Having a bumpy, jarring ride is one thing. Next is the handling, which can cause harsh ride difficulties in stopping, as traction will be compromised. Same goes the other way around. If your tires are under-inflated, your tires are prone to more friction, and thus reduce their lifespan. Nonetheless, riding a vehicle with a set of tires that doesn’t have the right air pressure will affect the overall performance of your riding experience. So, it’s pretty much basic to regularly check the pressure of your tires. That’s where tire pressure gauges come in. First of all, there’s a reason why those plated/laminated specifications were placed on your car door’s side panel. That’s where the tire specifications and guide are inscribed, along with the ideal tire pressure for various road, weather and load conditions. When in doubt, look it up. 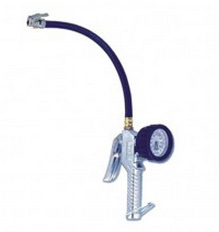 Now, going back to the use of tire pressure gauge, this tool is essential for measuring the air pressure in your tires. 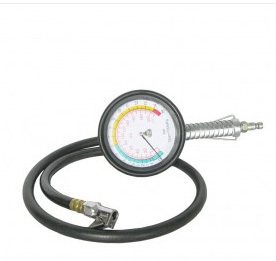 Moreover, the gauge is also used for checking the tire’s current pressure state. This is vital to ensure your tire has the optimal amount of pressure to ensure better handling, comfortable ride, and avoid accidents when driving. Generally, there are three kinds of gauges that are being used for tire pressure reading: Pencil-type, dial and digital. Pencil types are those handy pen-like chuck apparatus. Pencil types are usually preferred by most car owners for its portability and compact state. On the other hand, digital types are lauded for its accuracy and user-friendly characteristics such as the LCD screen for easy readability and convenience in usage. 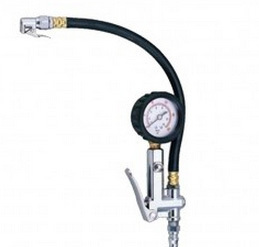 Meanwhile, dial tire pressure gauge is known for its durability, consistency and precision. No wonder this type of gauge is still being employed in most tire shops and auto-mechanic service centers. However ancient, dial tire pressure gauge still runs at par with those digital ones in terms of efficiency. ABest Industrial Supply offers the best line of dial tire pressure gauges that meets the requirements for both garage and on-travel uses. The tri-function TP series gauges stand versatile and resilient for wear-and-tear use, and easy-to-store built, making this ideal for use inside and outside the garage. Geared with 4 measurement unit-options for precision and accuracy in reading tire pressure, the TP series can also be attached to a pressure source with quick pressure release for facilitating quick tire inflation and deflation. The gauge has an interchangeable tire chucks to accommodate other tire chuck sizes, while the hose swivel eases maneuverability. More hydraulic and air tools? Please visit ABest Industrial Supply’s official website to see more grade-A top-rated industrial supplies!